Amanda the bizgal has always believed in feeling S.E.X.Y. inside and out and now is your chance to hear her secrets on turning yourself into the ultimate branding package. Join Amanda the bizgal for this FREE call as she dishes on her top 5 strategies of taking your passion and power and turning it into a very successful YOU. Join me on November 5th at 7:00 pm est! Amanda the bizgal’s tell-all book! Be Inspired . . . . Celebrity Branding Expert Amanda the bizgal takes you on her journey of starting 3 businesses and shares with you the tips she has learned along the way and the experiences that have shaped her entrepreneurial spirit. 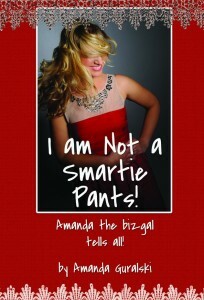 Revealing, funny, and full of tried-and-true advice, I am Not a Smartie Pants is your behind the scenes glimpse into Amanda the bizgal. Amanda the bizgal is your perfect go-to partner when gearing up for your big “leap”! Big interview coming up? Resume in need of a facelift to get you noticed? LinkedIn fizzling rather than fueling your network? Promotion or job change looming in your future and you’re scared and excited all at the same time? Entrepreneurial ideas keeping you up at night with no idea how to get going? Just looking for an unbiased listener to help you sort out a conflict or career issue? Amanda the bizgal is only a phone call or café away to help you regain your focus, sort out your pros and cons, and update your savvy. Contact Amanda the bizgal and get yourself in on one of the most productive hours you’ve had! She’s immediately engaging and totally all about you!